Do the words above mean anything to you? Let me tell you, I cannot sing this song without a well of emotions boiling up inside of me, especially when I sing the Spanish version of it. Now I know it is not all about emotions, but God did create us with an emotional side. And when I think about what Christ did for ME on the cross, I just cannot help but become emotional. I simply cannot read about the crucifixion story in Matthew 26-28 or in John 18-20 without sobbing. When I think about how they scorned and scourged and bruised MY Saviour, I just cannot help it! Albeit, I know deep within, that His suffering were to bring unto ALL PEOPLE eternal life. He took the pain, He took the penalty, He who knew no sin bore the sin for us! Oh how the sinless, most impeccable, spotless ONE took upon Himself our sin, and bore our shame upon a cross! Does that mean anything to you? 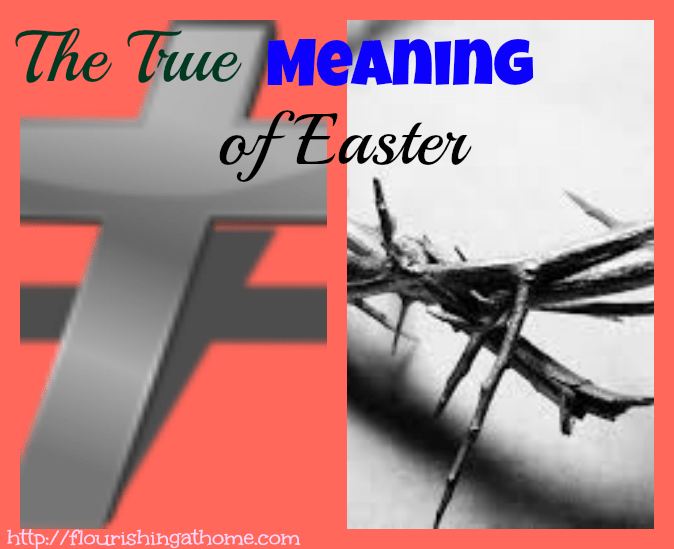 In fact, what does Easter really mean to you? Is it about decorating and eating Easter eggs? Is it about all the Easter candy that floats around during this time of year? Is it about eating fish on Good Friday? (Another childhood tradition back in the Caribbean). I remember growing up our traditional Easter Season began with Palm Sunday. We used to celebrate Palm Sunday by waving palm leaves in a march after the Sunday morning service. I remember getting up super early on Good Friday to catch the beautiful sunrise, eat my mom’s yummy Good Friday breakfast, watch my brothers and other kids in the neighbourhood prepare kites for flying, and getting all my chores done super early so I could sit and watch the Easter movies all day on Good Friday. I so used to love those crucifixion themed movies. I do not remember them all now but I specifically know there was one called “The Robe”. And then to top of the Easter season, we would go the beach on Easter Monday and have a blast all day. Families got up early and prepared huge meals and took them to the beach. That alone shows that there was no intent to leave the ocean anytime soon. The entire chapter of Isaiah 53 is heart wrenching and bone chilling! What if Christ had not paid the debt for our sins? Where would we be today? 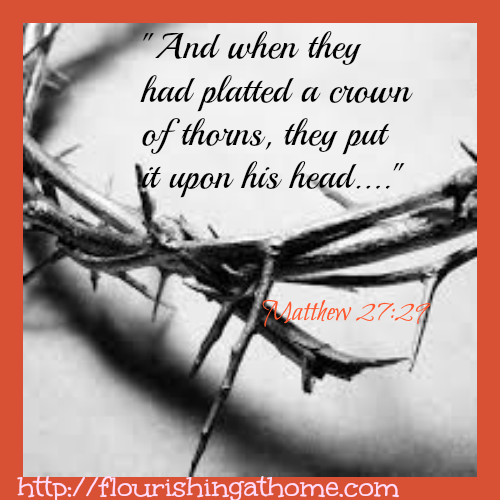 Can you see within you the crown of thorns being placed upon His head? Can you hear within you the nails being driven in His hands and feet? 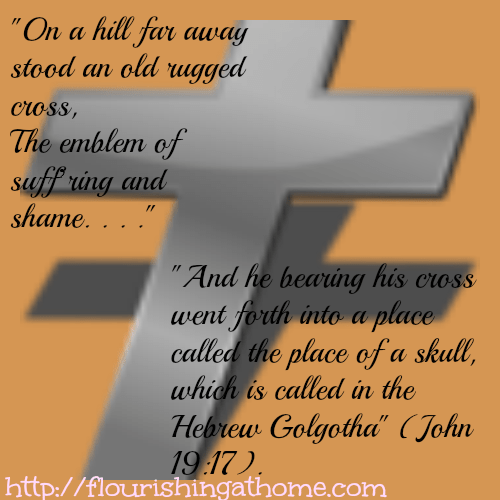 Can you see within you Him carrying that heavy cross up to Golgotha? Can you feel within you the agony and the pain He went through for you? Oh my friend, He went through a great deal just to save us from our sins. Consider how He demonstrated His Love toward us in these Meditational Easter Verses printable below. And if Easter means nothing to you, I encourage you to stop for a minute and consider what Christ did for you on the cross. He did it my friend, He did it for YOU and for ME, let us not push Him aside. Consider His love and invite Him into your life Today and let Easter mean more to you than just keeping traditions and having fun! 13 For whosoever shall call upon the name of the Lord shall be saved (Romans 10:9-13). One of my favorite songs about the Cross is by the Gettys: The power of the cross (I tried inserting a YouTube video but was having issues so I left it out). But the link will take you to a YouTube video of the song. Such powerful words: I cannot sing this song without being deeply moved, especially when it comes to the last line in the chorus. Here is the first verse and chorus. I know this post was a bit lengthy, but I hope during this passion week, you will find the true meaning of Easter in walking with Christ!! What a wonderful post! Christ is risen! Thanks, Alli! Happy Easter to you! This is a beautiful post. Just beautiful. It’s blessed me today 🙂 And I feel the same way about The Old Rugged Cross and several other hymns. Well, Amen. I am glad I took the time to write it. Christ has done so much for us! Those are three of my favorite songs ever! Beautiful post! Thank you for sharing, and Happy Easter! Happy Easter to you, too Kristen! I am glad you enjoyed the songs! Wonderful reflection of what Christ has done for us. Great collection of meaningful songs too. I fear the younger generation won’t grow up learning those meaningful words such as The Old Rugged Cross. Those old songs tug at the heart strings! The Via Dolorosa will make the hair stand up on my arms. Happy Easter to you and your family. I agree that the younger generation will miss out on those great old songs. What a shame! Via Dolorosa is truly a great song! What great words to meditate on! I enjoyed all the meditation I did last week–and let’s not let it stop! Every day we need to be so thankful for what he did for us. I love Sandi Patti’s song too–she was my older sister’s hero ;). Amen, Tammy! All the mediational words stuff I read on blogs, including yours, have truly been a blessing! We definitely cannot repay Him fully for all He did for us. Easter is such a great time to remember…..not Easter alone but the world recognizes what He has done during this time. Praise God for His wonderful love toward us! Dê alguma apreciação para o seu chefe. As empresas, especialmente as internacionais, usar o Pink Sheets como uma plataforma de negociação para evitar as regulamentações impostas pela SEC para negociar ações nas principais bolsas de valores. O que Fisher e seus colegas podem não ter percebido, no entanto, foi a de que não há uma maneira mais fácil para aliviar a dor da perda romântico. Quando The Vampire Diaries 4ª temporada estréia esta semana com Pains, Elena será a transição depois que ela fez Stefan salvar Matt primeiro. Por exemplo, do grupo O é suposto comer muita carne, mas os produtos lácteos são todos, mas proibido. Alex Daley, editor sênior de Tecnologia Extraordinária Casey, procura nomes desconhecidos, porque é onde ele encontra o grande cabeça. No entanto, nesta etapa, culpando um ao outro não vai ajudar, mas o cônjuge culpado deve suportar o peso da raiva do outro cônjuge. Brittany de Pretty Handy da menina é bastante impressionante. Combinando informações de uma variedade de fontes dá uma imagem mais completa.